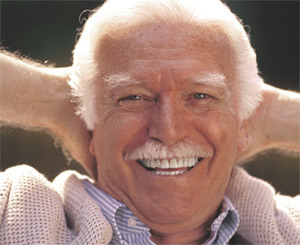 Dental implants are one of the most important advances to come along in dentistry over the past few decades. Designed to look and function just like a real tooth, dental implants are a near-perfect substitute for natural teeth and can last a lifetime. Missing a permanent tooth can have negative consequences on a person’s self-confidence, ability to enjoy life and his or her health. Traditional tooth replacement methods, such as bridges and crowns, slip and fall out, impose eating restrictions on the patient and allow the jawbone to recede. Dental implants, by contrast, allow for a full diet, do not slip or cause embarrassment, and protect the health of the jaw. Dental implants are tiny titanium screws that are inserted into the jaw, and onto which a connecting piece (“abutment”) and crown are attached. Because they are anchored in the jawbone, dental implants are incredibly strong, allowing patients to chew and eat anything they would with their natural teeth. The dental implant surgery takes just about an hour in our office. The procedure is very comfortable and most patients report only some mild discomfort as the anesthesia wears off. Dental implants rely on the miracle of osseointegration – the fusing of bone with an artificial material. In this case, the material is titanium, which has unique properties that allow it to easily bond with bone. After surgery, the implant is left alone to heal for several months. Then, once osseointegration has occurred, you will return to your general dentist for the final crown fabrication. The jawbone depends on regular stimulation from the chewing and biting actions of teeth in order to maintain its size. In fact, when a tooth is extracted, the jawbone almost immediately begins to resorb. Eventually, jawbone loss starts to negatively affect a person’s health and the aesthetics of their face. Dental implants are the only replacement tooth method that can save the jaw, as they provide the stimulating actions necessary for jawbone health. In addition to that, they allow for a healthy, balanced, fibrous diet. The dental implant process always starts with a consultation to determine the need for bone grafting, extraction and other specifics of your case. Once we have a treatment plan in place and the bone is adequate in size, we will proceed with the dental implant surgery itself. The surgery takes just about an hour, during which time the surgical site will be totally numb. We also offer sedation to keep you comfortable. As the anesthesia wears off later in the day, you may have some discomfort, but it is typically controlled adequately with over-the-counter medications. The implant is then left alone to heal for several months, after which time you will return to your dentist for a final crown. It is important when comparing the cost of dental implants to other treatment methods to remember that dental implants are usually more affordable over time because they typically don’t need replacement. By contrast, a bridge must be replaced every 10 years and causes damage to both the jawbone and adjacent teeth. If you are missing a tooth and are looking for a better solution than dentures or bridges, please visit our Dental Implants FAQs page and call us today at Monterey Oral Surgery Phone Number 831-372-2882!